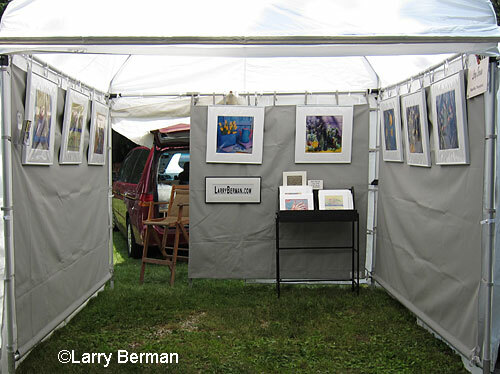 The difference in Pro Panels and mesh walls to hang your artwork on in an art show booth. Pro Panels make your booth look like an art gallery. But if you drive a small vehicle, like a minivan, they will take up approximately 50% of the available space not leaving much room for your canopy and artwork, depending on your medium. Pro Panels are easy to move around and set up. They are made of 1/2 inch electrical conduit with Styrofoam covered by carpet. They are light weight and sturdy. I have no trouble lifting two panels at a time. If you’re concerned about the weight, they also make two piece break down panels but those are only 30 inches wide (and more expensive) so you need twelve for a three ten foot walled booth instead of the standard nine panels (38.5 inches) display. Mesh walls are made from a fabric similar to lawn furniture. The are easier to handle and take up much less space in your vehicle because they roll up, important if you drive a minivan. But there is some major backlighting, which can be a distraction if you have the sun behind your booth. I downsized to a minivan, kept my Pro Panels to rent for local Pittsburgh shows, and purchased a Light Dome with mesh walls. I like the ease of the mesh walls and keep my canopy sides closed behind them to cut down on the backlighting. I do carry a step stool to put the mesh walls up. Though it’s recommended to connect them to your canopy frame prior to raising the legs. I find it easier to raise the legs first so I don’t have to lift the weight of the mesh walls along with the canopy. Also I should mention that after setting up with only eight photographs hanging on the walls, I prepared enough to fill the booth for the next show. Pro Panels are available from http://www.propanels.com. Mesh walls are available from http://flourish.com for most any canopy, and also available from Creative Energies for their Light Dome canopy.